I realized that I haven’t posted a recipe in awhile, so I wanted to share one with you. I don’t dabble in Indian cooking very often, mainly because my mother in law is a great cook and it intimidates me. I was given a simple Indian curry recipe the other day though and it turned out pretty well! There are about 324872340984 different variations of “curry,” which makes my brain explode a little because I like things black and white. There is a lot of grey area in the land of curry, so they can turn out very different. There are tomato based curries, cream based curries, any kind of variation you can think of. This took me less than an hour in total to make, including prep time. What makes it healthier is the lack of cream, the type of oil, and the fact that I used chicken breasts instead of thighs. If you want a more decadent curry, by all means use those other ingredients. It’s up to you! Chop the onion into small pieces and sautee with olive oil in a medium saucepan for approx 5-7 minutes, until soft and slightly browned. Add the garlic ginger paste and saute for another 1-2 minutes. Slice the chilis and add them to the pan for another minute. Combine all spices in a small bowl so that you are able to easily dump them at once into the saucepan. Once the chilis have cooked, add the spices and mix thoroughly. Place the lid on the pan to allow the moisture to stay with the mixture for another minute. Cut the chicken breasts into 1″ cubes. Add the chicken and tomatoes to the saucepan and make sure it is thoroughly coated. Place the lid on the pan and continue cooking for about 8-10 min, stirring occasionally to make sure the chicken is evenly cooked. After the 10 minutes, add the yogurt and continue cooking until the chicken is cooked through. I simply removed a piece and tested it. You can add more or less yogurt based on your creaminess preference. Serve over your choice of rice or naan! * Garlic ginger paste can be found at your local Asian store. If you don’t have access to this, simply use 1/2 Tbsp of garlic and 1/2 Tbsp of fresh ginger. ** I used coconut milk yogurt in this recipe. You are welcome to use regular plain yogurt or Greek yogurt as well. Keep in mind that it will be thinner with regular and thicker with Greek yogurt. You can also adjust the spice level by adding more or less peppers and chili powder. When I made it, I used 4 chili peppers and 1 tsp of chili powder, but that’s because I am a glutton for punishment and I LOVE SPICE. Question of the day: Have you made a curry before? What is your favorite kind? Glad I have a fellow spice lover! 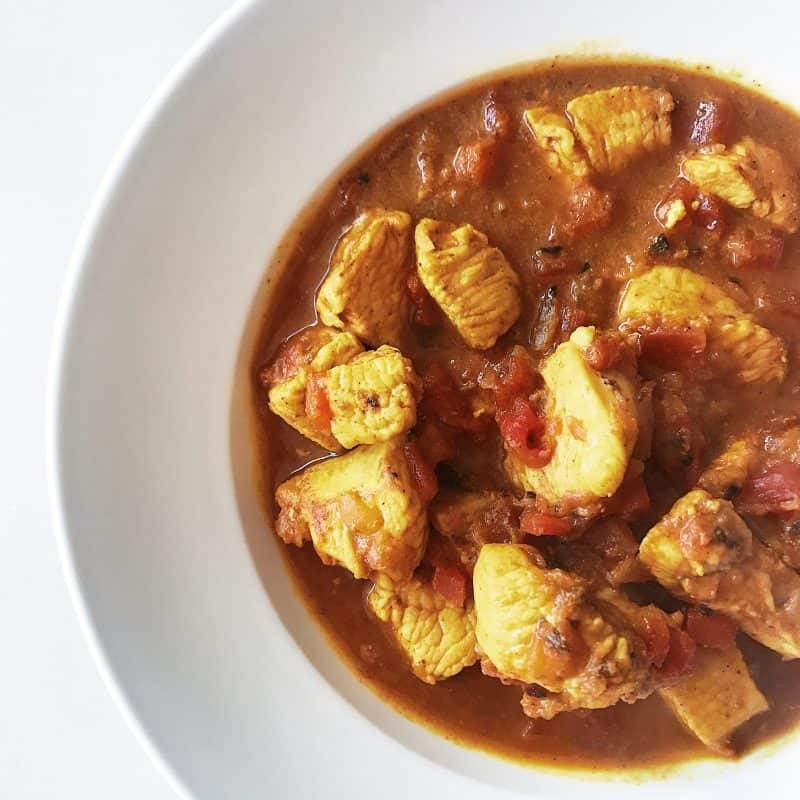 This seems like an awesome chicken curry, Erin! I love it because it is a healthy dish! Mmmmm!! Looks so yummy and healthy. Will try this for sure.